All words that can be used to describe this powerful novel from the lovely Lisa Heathfield. 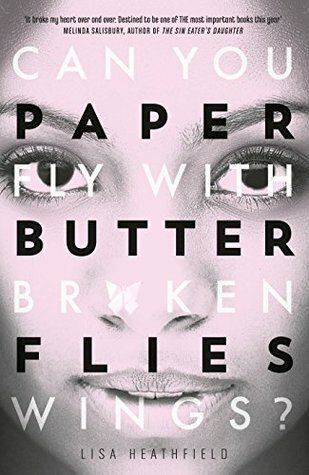 Paper Butterflies made me feel irrationally angry and left me feeling broken hearted whilst simultaneously filling me with hope. I think it is safe to say that Lisa Heathfield is a master of pulling on our heart strings whilst dealing with the most sensitive and difficult of topics. Before picking up my copy of Paper Butterflies, I had been warned by a few of my bookish friends that this book would leave me in tears. Tissues and chocolate were advised as my companions for this story and I am so glad that I took their advice (on the tissues, at least). This is a harrowing story of child abuse and feeling unable to speak out for fear of not being believed. On the other hand it is also a tale of beautiful friendships and finding hope in the darkest of situations. From the very first pages of this book I truly felt sick to my stomach. There were several occasions when reading about Kathleen’s abuse towards June that I almost thought I wouldn’t be able to read this book. Then I realised how lucky I am to have never been in June’s position and I felt that the least I could do for June and all victims of abuse in the world is endure the words on these pages and read her story. This is by no means an easy read. Kathleen is a horrible creature (I cannot bear to call her a person, I’m afraid) and there were so many occasions where I found tears streaming down my face as I desperately fought the urge to throw the book in anger. How anyone can abuse someone at all, let alone a child, to this extent is completely out of the realms of my imagination and I found it very difficult to understand. Kathleen is written to be so realistic and I could feel my own skin start to crawl when her name was mentioned and I dreaded what was to come next. Something that pained me more than anything in this story was the fact that as a reader we can see how desperate June is to speak out. She so wants to tell her father or teachers about the abuse she is suffering at home but she is so frightened that nobody will believe her that she doesn’t. This book is very cleverly written to incorporate June’s point of view and it is easy to understand on so many occasions why she eventually chooses not to tell people, I just so wish she had felt able to. This really struck a chord with me as a teacher because I would really honestly like to believe that my pupils would feel able to tell me something like this so that I could help to protect them and it really made me think about how huge a responsibility being a teacher is. I really loved the structure of this book and the fact we flipped from June’s young life and upwards whilst also fast forwarding to the ‘After’. The big reveal of the ‘After’ was a huge surprise to me. I had no idea it was coming and I definitely wasn’t expecting it. The last few chapters of this book gave me so much to think about and I have to thank Lisa Heathfield for that. She truly brings into question the importance of a victim speaking out and shows that by not speaking out things can get even worse than imaginable. I would hope that reading this book may give encouragement to victims of abuse to feel able to talk to someone, to push past that barrier of fearing they will not be believed and to communicate their pain to someone. June and Blister. Oh my lovely, lovely Blister. Just as June is struggling to see any light in her life she meets her darling Blister and his enormous, loving family. I adored their friendship and blossoming relationship from the very bottom of my heart. There was something so pure about the way in which they found each other and spent their time together. There are some truly heartbreaking moments between them but Blister truly is a ray of bright, sparkling light in June’s life throughout this book. Lisa Heathfield is such a strong writer. Not only does she succeed in telling a harrowing but powerful story, she has created characters that as a reader you will deeply care about. There is no way you can come out of this book not having hated Kathleen and fallen in love with June and Blister. This book evoked so much emotion in me that at times I just had to put it to the side and calm myself down. The ending of this book is so well thought out and although I just really want more, I also loved the way in which this was left. I cried for a good half an hour after closing the final pages of this book and I think those tears were a mix of heart break and hope. Paper Butterflies is a book that I encourage everyone to experience. Whilst it may not be an easy book to read it is certainly one that will stay with me for a very, very long time and has changed something inside of me forever. Phenomenal. Have you read Paper Butterflies? What are your favourite YA contemporaries? Wow! What a heartbreaking novel. It always astounds me how reading can make us experience such extreme emotions like this! Honestly, this probably isn’t a book I would find myself picking up. While you’ve really sold me how on powerful it is, I try to only read happy things in my free time. Is that naive? Probably. But I only have so much free time, and why would I fill it with such sadness and darkness? I totally understand that and this is definitely a book that is upsetting to read so it may not be for you. If you ever feel that you can give it a chance I can promise that there is also plenty of hope laced throughout the story too but it does take its toll emotionally!